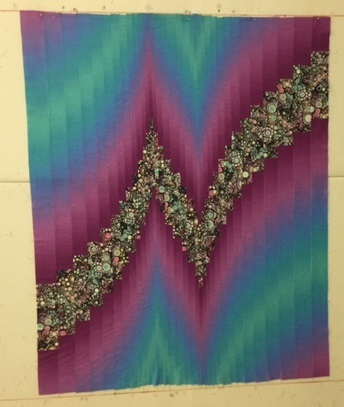 The following pictures will assist you in making the Two Fabric Bargello quilt. 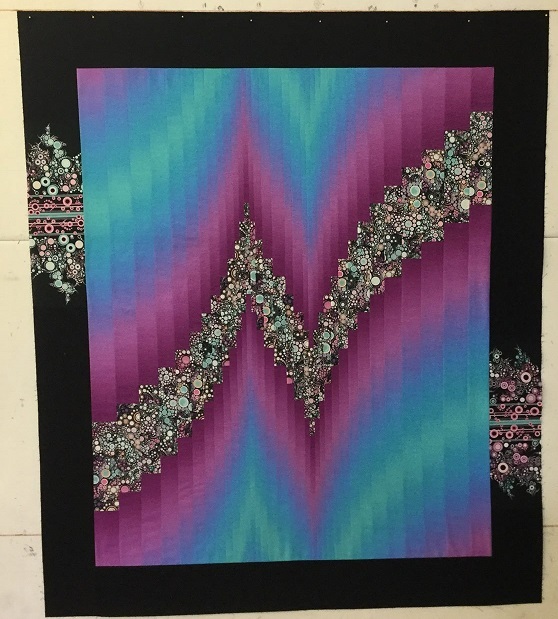 If you look at the pattern cover page you will notice that the designer used the same fabric for the border as was used for the insert fabric. 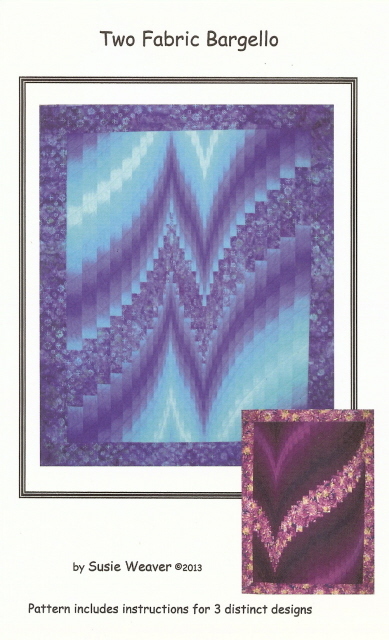 In my samples and kits I used the Effervescence fabric for the insert and Black Kona for the border. 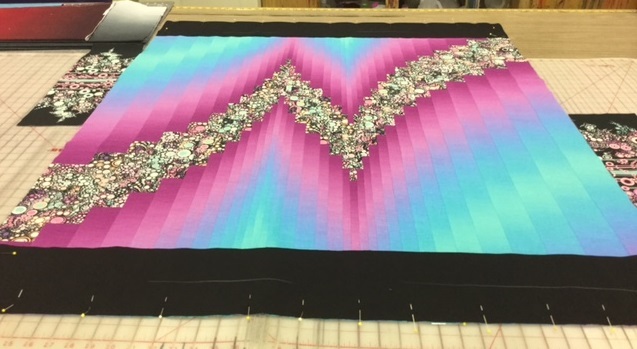 The Effervescence fabric has a border print on one side so that border print is cut into pieces and sewed into the Black Kona for the borders. 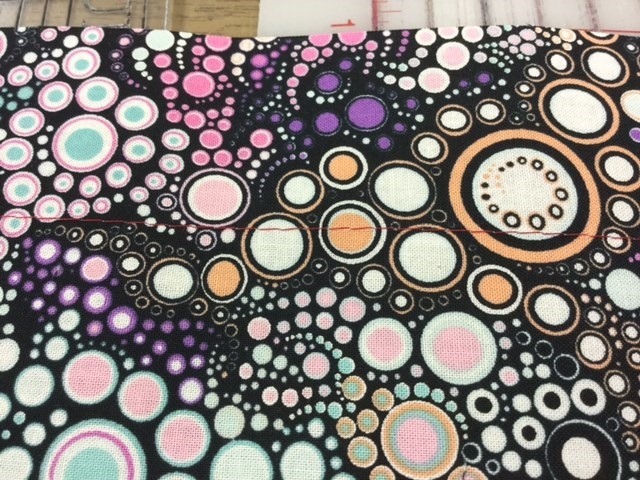 I found it easier to work in two one yard sections instead of a large 1 3/4 yard piece, as stated in the pattern. 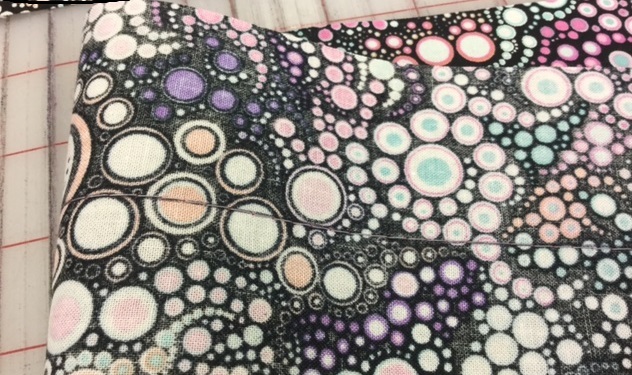 In the kits, we provide 2 yards of the Gelato or Gradation fabric. The little extra fabric allows for any miss cuts and for adjustments between cuts if necessary. 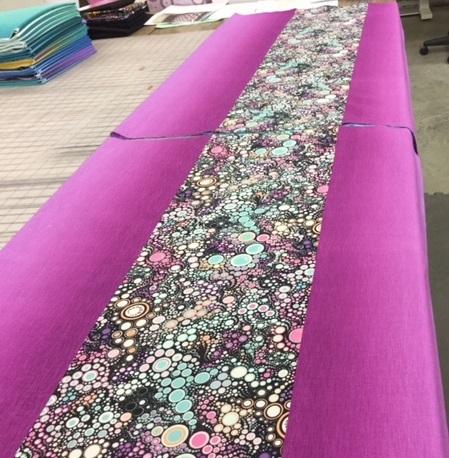 Effervescence Fabric: Remove the selvage edge from the non-border side then cut two (2) 9 1/2 inch strips lengthwise so you will have two 9 1/2 x 36 inch strips for the insert piece. Then, on the wrong side of the fabric draw a line 1 3/4 inch for Check Mark Design or 2 inches down from on one edge. Sew a basting stitch along this line with a thread that is visible as you will be using this basting stitch to line your strips up later. 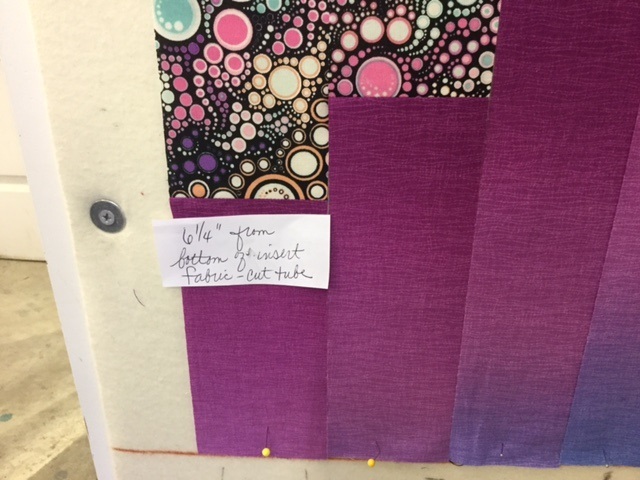 These pieces will be sewed into the Gelato or Gradation fabric to create the tube. 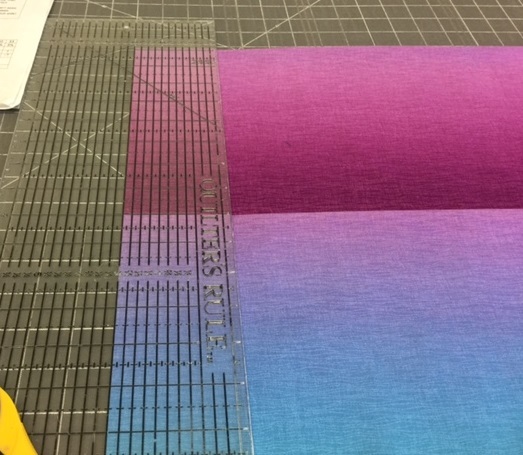 Gelato or Gradation Fabric: Remove the selvage edge from the 2 yards of fabric, cut into one yard pieces. 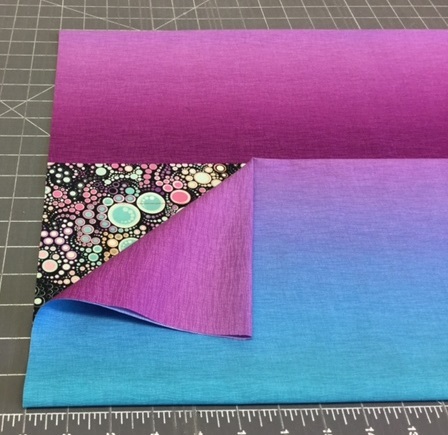 Sew a 9 1/2 inch piece of insert fabric into each yard. There will be two one yard piece tubes. 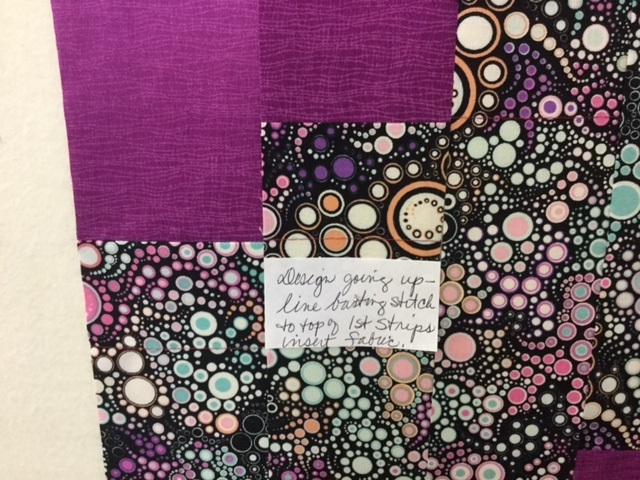 Begin cutting strips as per the design page in the pattern that you want to use. This sample is for the Lightning Bolt design. I fold the fabric so my 24 inch ruler will be able to cut the entire width. 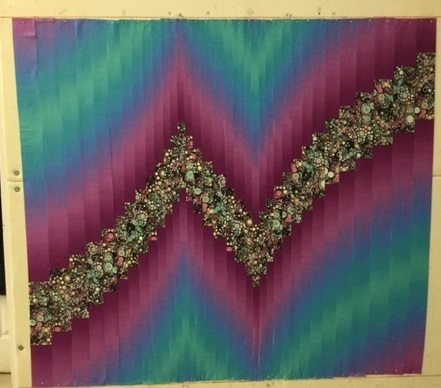 I cut all 33 strips as per the pattern and pinned them to my design wall. I begin on the left hand side of the design to cut the strips. 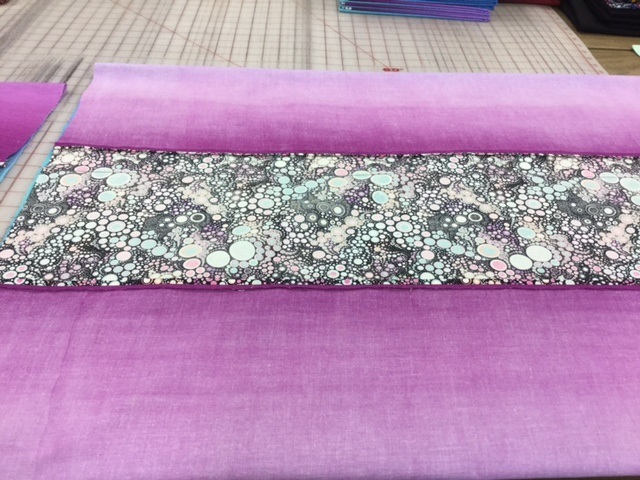 Take the first strip and measure from the bottom of the insert fabric 6 1/4 inches and clip the tube. This is the first long strip on the left hand side. The design is going up so take the second strip and line the basting stitch to the seam line on the first strip. 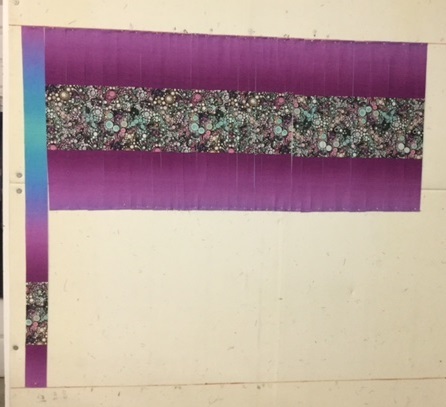 The design will step up 1 3/4 inches and then line the strip to the bottom of the first strip and cut the second strip. Continue to line the basting stitch of the next strip to the seam of the previous strip until you get to strip number 13. 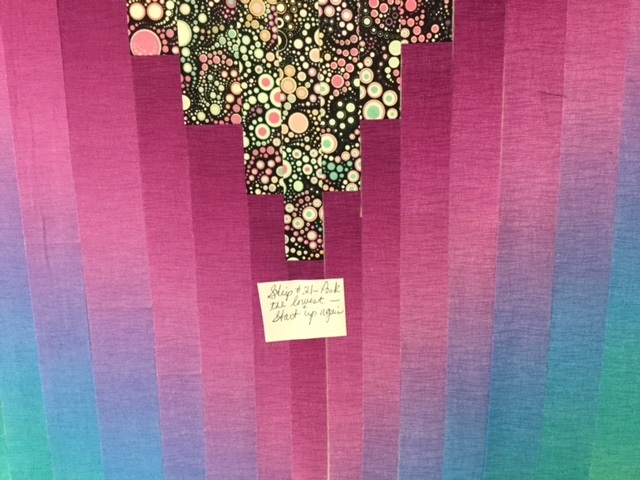 Now, the design is going down, so line the seam of strip number 14 to the basting stitch of strip number 13 and continue to make the design going down until you get to strip number 21. Then, the design is going up again, so line the basting stitch of strip number 22 to the top seam of strip number 21 and continue going up until you are at strip number 33. Note: Sometimes you are able to measure from the bottom and other times it is easier to measure from the top. Either way you do it just try to keep the strips even at the top and bottom. 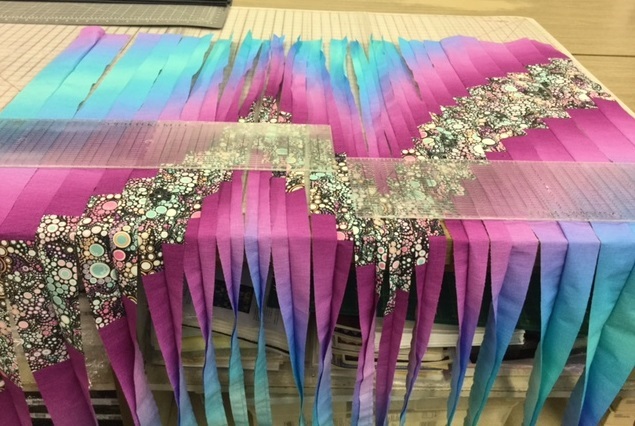 I begin sewing two strips together, then four together and so on until all strips are sewed together. 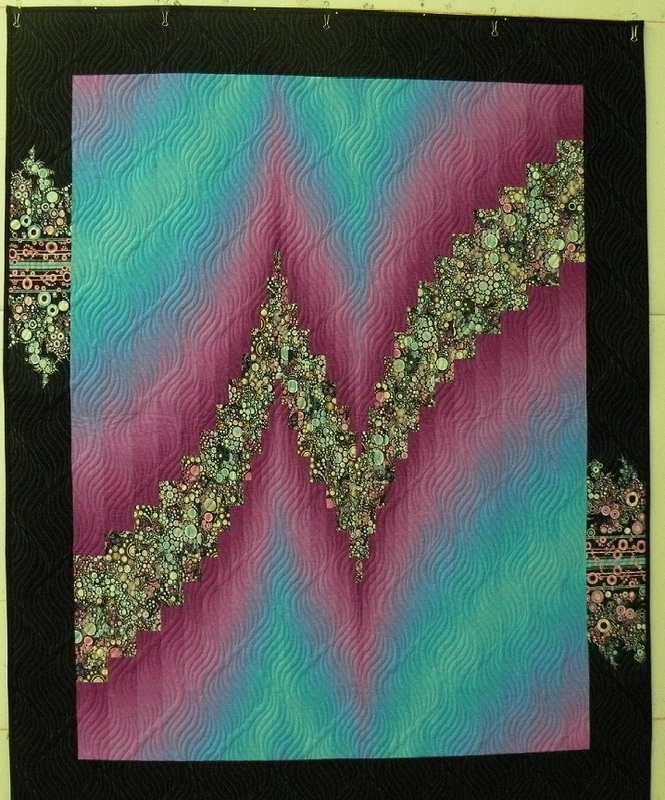 Borders - I sewed the Black Kona on the top and bottom of the quilt. 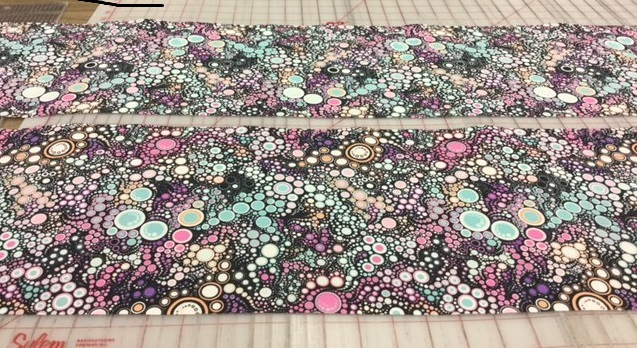 The border design that was cut off of the Effervescence is cut into four 5 1/2 inch wide pieces which is the same width as the borders. I sewed two of these together and then sew them into a 10 1/2 inch piece of Black Kona. 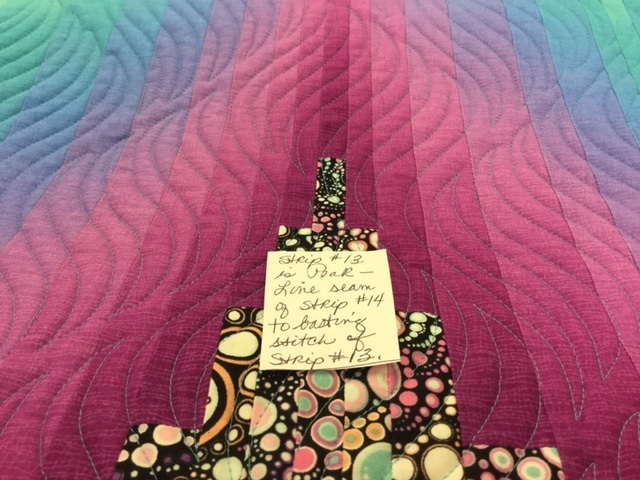 Then, sewed these pieces to Black Kona and sewed to the sides of the quilt. 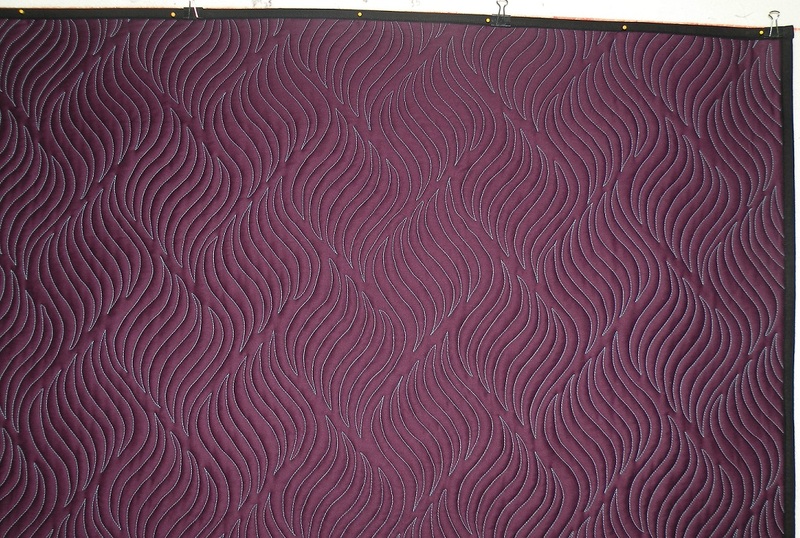 I have quilted it with the Time Warp Pantograph and have added two additional pictures. 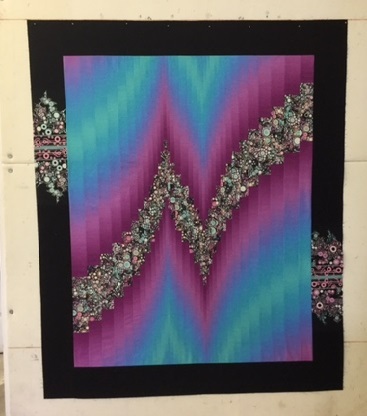 I hope these pictures will help you make the Two Fabric Bargello quilt. It is fun to make and add your own ideas to make it your own design. If you have any questions, please let me know.